FX has done a fine job of creeping us all out with their promotions for Guillermo del Toro and Chuck Hogan's new horror-drama The Strain. Having seen the first four episodes of the series, to put it simply, the ads are actually pretty tame by comparison to some of the disturbing events that transpire in the first few episodes of this bloody, creepy series. If The Strain's goal is to remind us that vampires are actually scary predatory creatures and not the Edward Cullens and Eric Northmans we’ve been appreciating over the last few years, it succeeds and then some, successfully merging a sci-fi contagion story and blood-sucking horror. Based on a book by Guillermo del Toro and Chuck Hogan, who both executive produce, along with Carlton Cuse and Gary Ungar, The Strain stars Corey Stoll as Dr. Ephraim Goodweather, the head of a CDC team that's called in to investigate a situation that has all the markings of a viral outbreak, involving a plane that lands at JFK airport and all aboard appear to have died of mysterious causes. On his team are Dr. Nora Martinez (Mia Maestro) and Jim Kent (Sean Astin). The investigation of the plane is just part of the story, as we’re also introduced to Thomas Elchorst (Richard Sammel) a mysterious man who’s actively involved in orchestrating the outbreak. Determined to stop it is Professor Abraham Setrakian (David Bradley), a pawn shop owner who recognizes what’s happening right away. 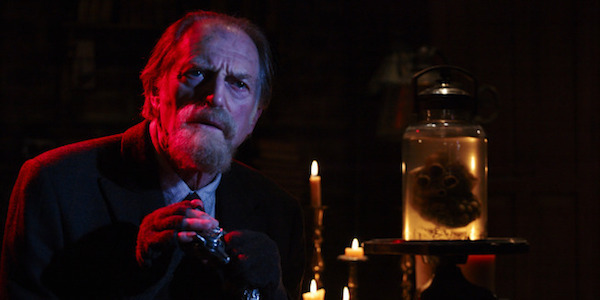 Sci-fi and horror don’t overlap all at once on The Strain. In fact, the two genres blend together very slowly as Eph and his team begin to investigate the situation they believe to be a virus and eventually discover something much darker. Their scientific perspective keeps The Strain somewhat grounded in our reality than it might be otherwise. This is a world where monsters aren't supposed to be real. Understandably, Eph and his team aren't quick to assume there are supernatural forces at work, and when they do begin to see what's happening, they're determined to understand why and how. As disturbing as some of the scary scenes are, whether they're particularly violent or gory, or some kind of twisted reveal related to the virus, The Strain isn’t doling out one scary horror scene after the next. This series chooses its horror moments with care, building up to them so they matter as much to the story as they do for shock value. And there’s definitely a fair amount of shock factor involved with some of these scenes. When it comes to the horror, The Strain takes it to the basic cable limit, unapologetically delivering gore, violence or just plain weird horror for our entertainment, discomfort and/or terror. The Strain makes good use of the substantial talent of its cast, and with its first few episodes, delivers an intriguing introduction, building momentum from one episode to the next. As cable channels go, FX doesn’t shy away from darker content and The Strain is a perfect fit for the cable channel in that respect. As for its potential to be a must-watch summer series, based on the first few episodes, my hopes are high and I'm ready to see more. The Strain premieres Sunday, July 13 at 10:00 p.m. on FX.